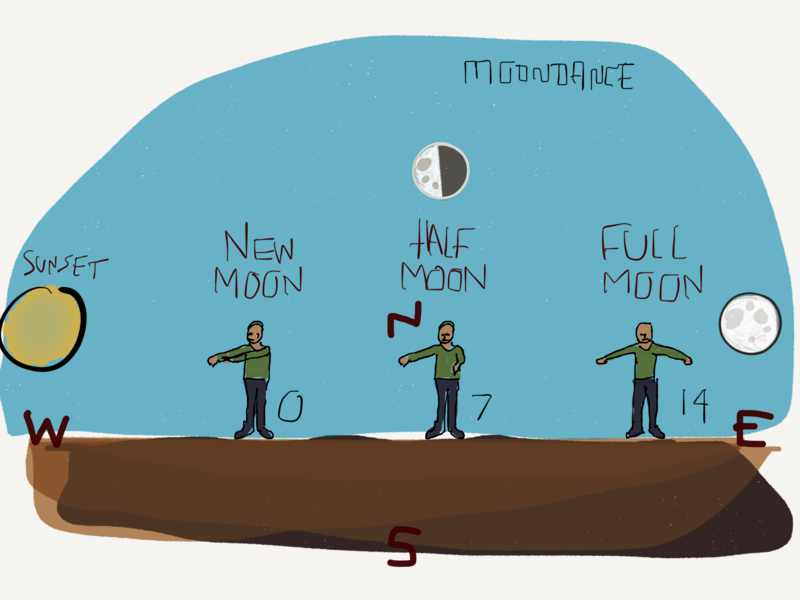 Learn the Moon phases by doing an easy dance. Point your right hand toward the Sun. Now point your left hand toward the Sun. Both hands should be pointing at the sun. Now, turn a little bit to the left, keeping both hands pointing at the sun. Swing your left arm out until it is pointing in the opposite direction from the sunset. Bring your hands together again and repeat this swinging motion. Bring your hands together again and point them both at the sun. This time, instead of swinging, bounce your left hand, leftward, some number of times… (14 is perfect if you can do it) …until it is pointing in the completely opposite direction from the Sun at sunset. Your left hand should now be pointing East. Was the moon at any one of those 14 hand bounce spots? That is the age of the moon in days. Please post your questions in the comments!